I offer two styles of chipped mirror. The first is the front chip and the second is the back chip. Both styles are similar in the process but the looks are not the same. With the front chip, you are looking at the silvering with the chipped surface in the front. With the back chip you are looking at the chip and the silvering is gone. This allows you to see through the mirror and changes the way the light reflects off the glass. The color and texture of the wall shows through, creating a border. The back chip is the most economical. The silvering and paint, chip better off the back. The front chip does not play nice and causes all sorts of problems. 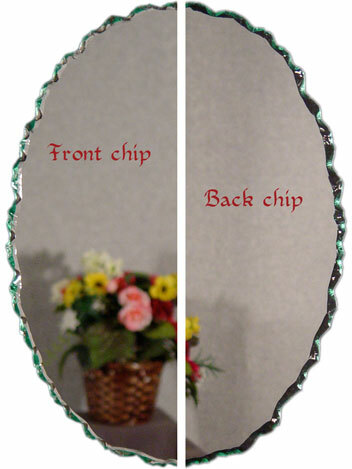 It takes more pressure to chip which causes the entire mirror to break. This is why the front chip cost twice as much to produce. Note: The back chip was photographed on a black back ground. 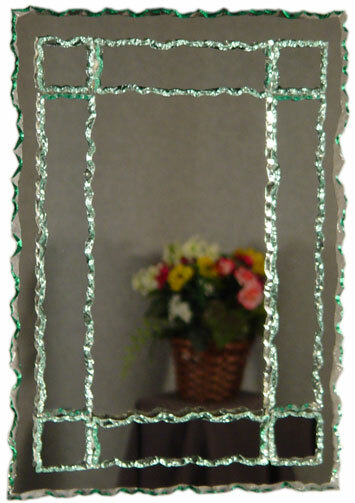 The best part of the process is that It allows for the customization of each mirror or set of mirrors. If you are looking at beveled mirrors that are 24 inches wide and 36 inches tall and you want to make it 2 or 3 inches wider to fit in your space, a Beveled mirror can be hundreds of dollars higher and take several weeks to get. 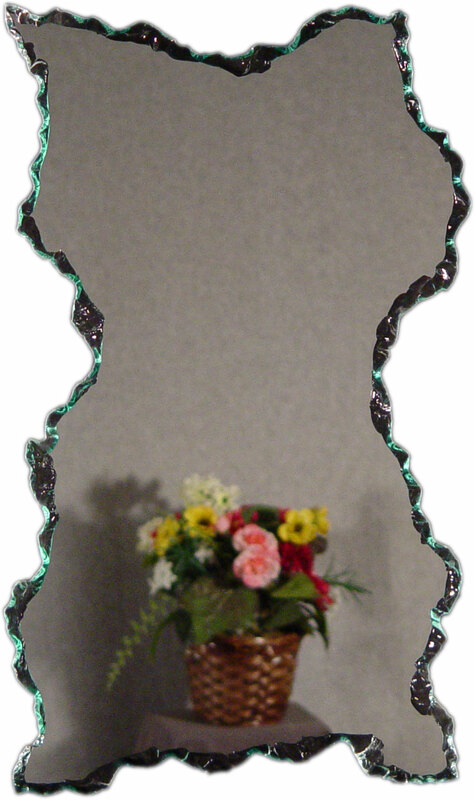 With the chipped edge mirror it can be made wider or taller, faster and cheaper. 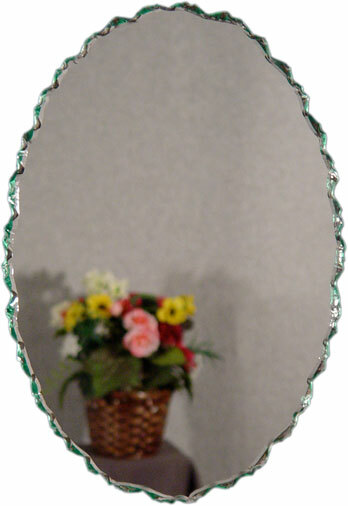 Oval mirrors can be short and wide or tall and narrow. It is a very popular shape for bathroom mirrors. My standard sizes of ovals. Rectangles are the most common shape of mirrors. 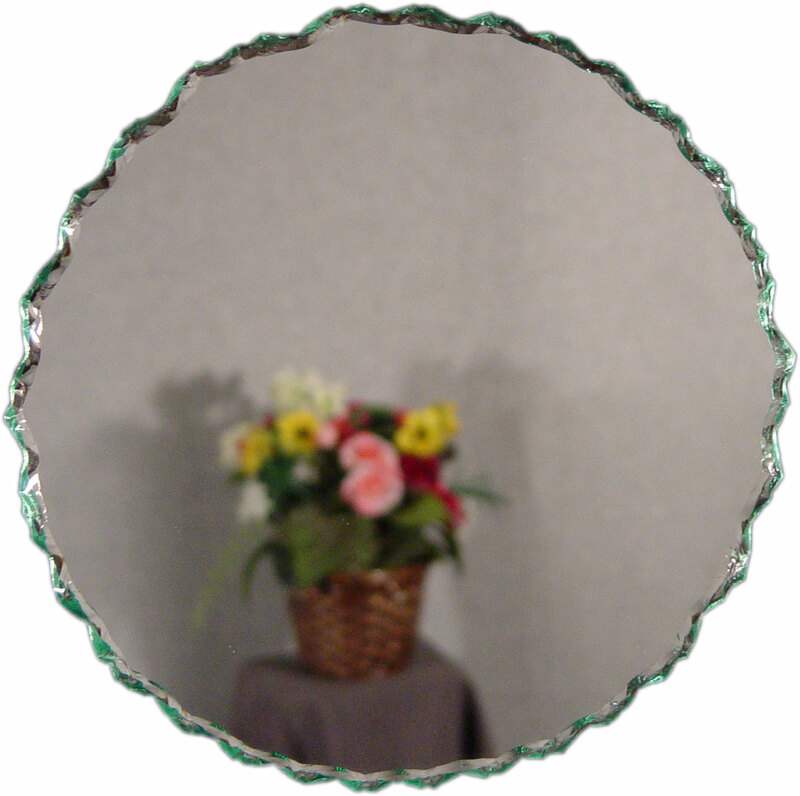 Most of the plate mirrors have polished edges. If you have plate mirrors in your home and you want to dress them up with a border I can create chip strips for you that can be glued onto your existing mirrors. They can be made 2 inches or 4 inches wide. This also hides the blackening that can sometimes occur. Contact me for price quote on chip strips. I can chip the edge of a large plate mirror but in most cases it would be best to use the chip strips. 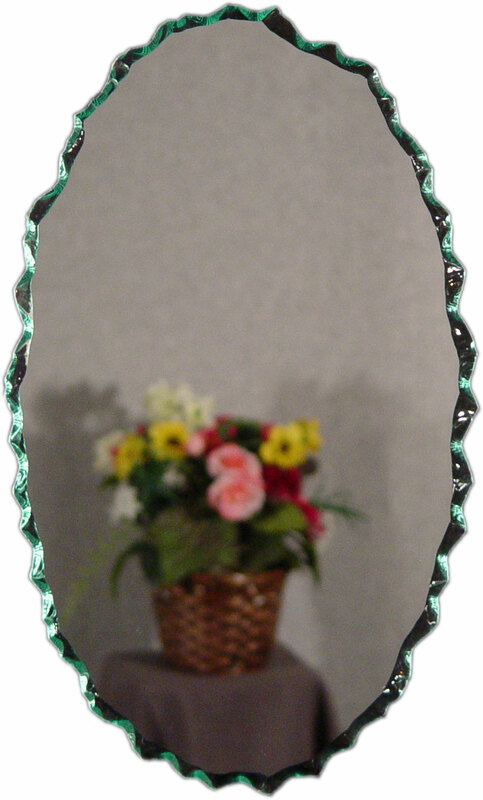 Smaller rectangle mirrors can be chipped and hardboard hangers can be added so that it hangs like an oval frameless mirror. 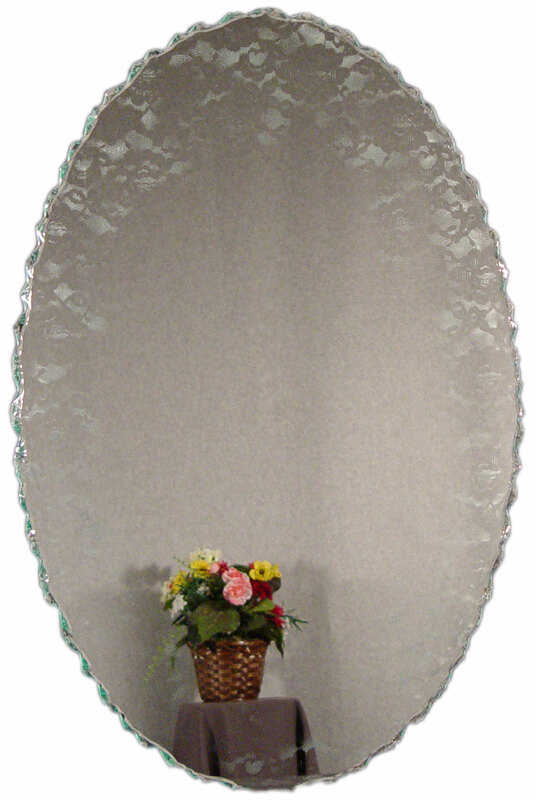 Rectangle mirrors do not ship as well as their oval counterparts so contact me for a price quote on shipping. I can deliver and hang mirrors within a hundred mile range of Kansas City Missouri. This shape can be use for bathroom mirrors and taller dressing mirrors. I can also fabricate taller mirrors in several pieces to make them more interesting. This also help make them easier to ship. The shape of the arch can be changed to meet your personal taste. It can be made flatter or the transition area can be rounded out. 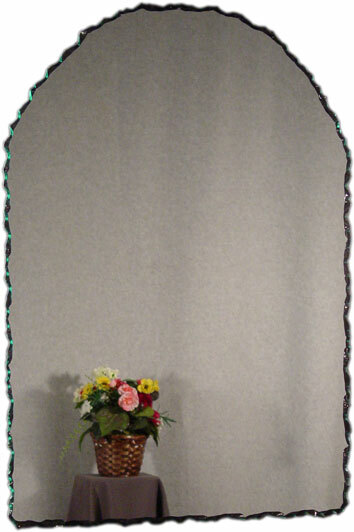 I can make from your pattern or provide you with arch top design specifications. 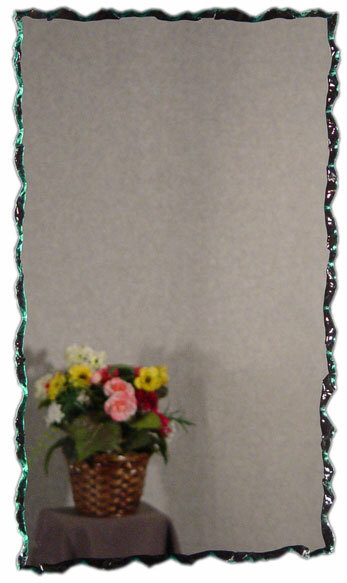 My frameless mirror line comes with 3/16 inch hardboard backing with hangers held on with rivets. They are ready to hang. Frameless mirrors can be made up to 20 pounds in size. Above that,there needs to be a mechanical devise to hold the mirror. This can be a small bolt through the hardboard with a rosette, or a metal bracket applied to the wall. As stated, Very large plate mirrors would require special hanging. 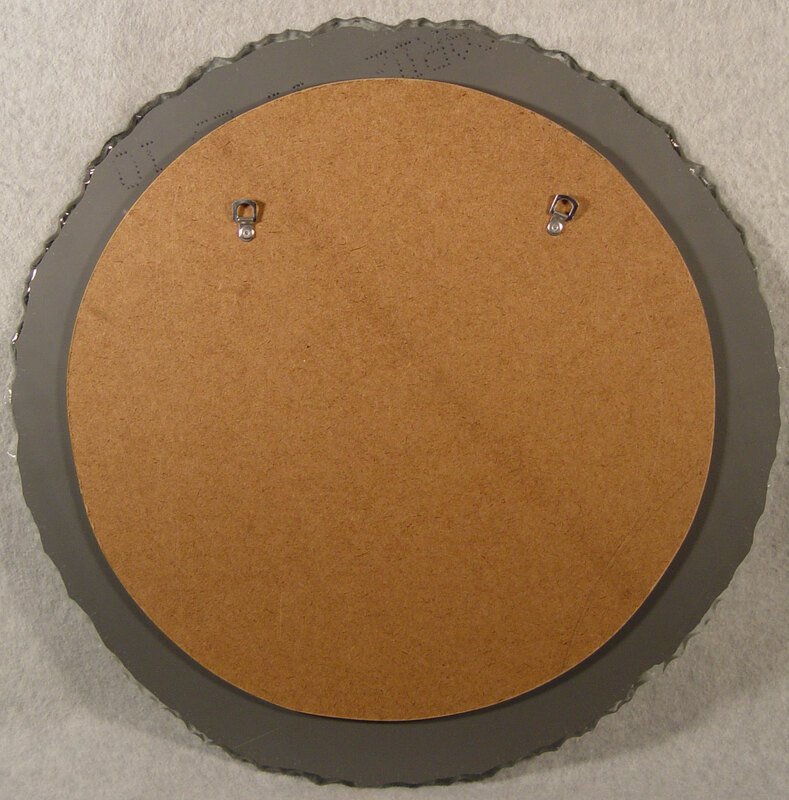 Chip strips are recommended for mirrors over 50 pounds. See samples below for chip strip sample.